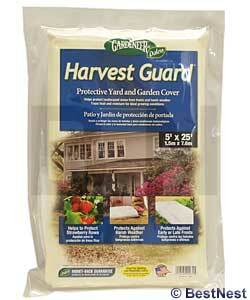 Extend the growing season for your vegetables using the Gardeneer Harvest Guard Frost and Seedling Protector. Placing this fabric over your plants creates a mini greenhouse effect, capturing heat and moisture for fantastic growing conditions. This protection increases seed germination and deters insect damage. The white color allows light to pass through the cloth so photosynthesis continues, and its design keeps insects away from the grass. The fabric is made to float above your plants, or may be secured with rocks, lumber, or garden staples. The 25' length may be folded over for added defense against frost. Protect your favorite plants from cold weather and frosts with this Harvest Guard Frost and Seedling Protector. Made in the USA.